Ticks are closely related to insects and spiders. Most often, they live out their lives feeding on wildlife. However, people may be bitten when they spend time in areas where ticks live. Ticks are most often found in natural areas such as grassy shorelines, wooded areas, or fields near wooded areas. They are rarely found indoors unless brought inside on clothing or on a pet. There are over 20 known tick species in Michigan. Several species of ticks are known to bite people and pets, and may harbor dangerous bacteria, viruses, or parasites. Not all ticks carry diseases, but tick-related diseases do occur in Michigan, and can be serious or fatal if not properly diagnosed and treated. It is important to see a doctor if you are ill and have recently had a tick on your skin or have been in an area that might have ticks. This information can be very helpful for a doctor to accurately diagnose your illness. 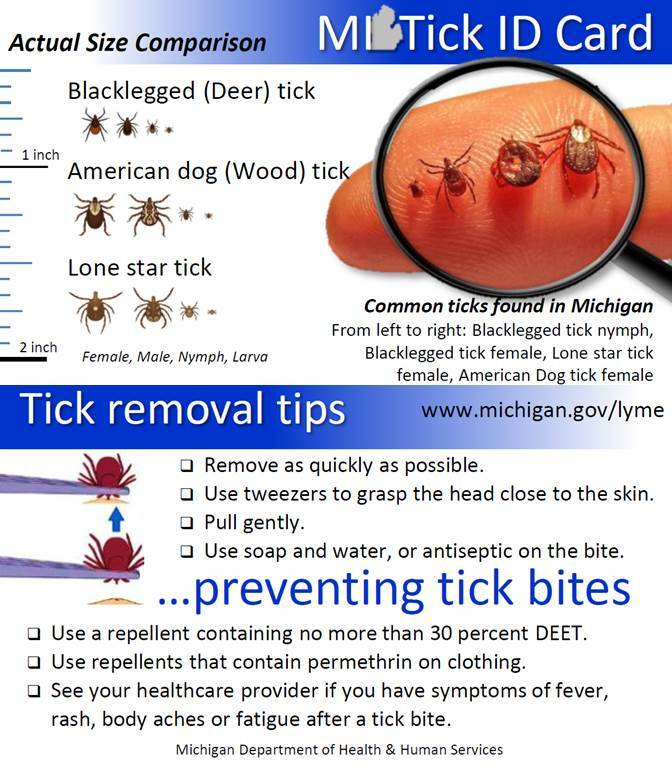 To learn more about ticks found in Michigan and the diseases they can spread, read the Ticks and Your Health brochure. Ticks generally prefer shady, moist areas in wooded and grassy locations. Be extra vigilant in warmer months (April – September) when ticks are most active. When recreating or working in areas with ticks, try to stay on well-groomed trails and avoid contact with overgrown grass, brush, and fallen leaves. Modify your landscape to create tick-safe zones. Check your skin and clothes for ticks. Wear light-colored clothing so ticks can be spotted easily. Perform daily tick checks after being outdoors, even in your own yard. Use a hand-held or full-length mirror to inspect all parts of your body carefully, including your armpits, scalp, and groin. Shower promptly after coming indoors to wash off and more easily find ticks. Remove ticks from your clothes before going indoors. To kill ticks that you may have missed, place clothing in a dryer on high heat for at least one hour. Insect repellents have been shown to be effective for repelling ticks and can be applied to clothing and skin. Whenever using an insect repellent, always read and follow the label use directions for proper application and safety concerns, and store away from children. Do not use products containing oil of lemon eucalyptus or para-menthane-diol (PMD) on children under 3 years old. Do not apply repellents directly to children. Apply to your hands and then put it on the child, avoiding the hands, eyes, nose, and mouth. Permethrin is another type of repellent, but it should not be applied directly to the skin. Permethrin kills ticks on contact. Some permethrin products are labeled for application to clothing. Such products once applied will stay effective as a tick repellent following several washings. Outdoor workers can find additional information at the NIOSH Tick-borne Diseases Safety and Health Topic. Prompt removal of ticks is the best method of decreasing the chance of infection. Pull upward with steady even pressure. Don’t twist of jerk the tick; this can cause the mouth-parts to break off and remain in the skin. If this happens, remove the mouth-parts with tweezers. If you are unable to remove the mouth easily with clean tweezers, leave it alone, and let the skin heal. Dispose of a live tick by submersing it in alcohol, placing it in a sealed bag or container, wrapping it tightly in tape, or flushing it down the toilet. Never crush a tick with your fingers. If you are interested in having your tick identified and potentially tested for the bacteria that causes Lyme disease, please see the instructions provided for the MDHHS Tick Identification and Testing Program. See your doctor when necessary. If you develop a rash or fever within several weeks of removing a tick, see your doctor as soon as possible. Be sure to tell your doctor about your recent tick bite and when the bite occurred. What tick data are available on the MiTracking data portal?